Dhule, the one of its kind city in Maharashtra is home to Laling fort. ahirani is the main language of this city the peculiarity of this area is that the day temperatures reach upto 40 degrees Celsius while the night are as low as 10 degrees Celsius which makes trekking interesting. Another thing which can be noticed here is the vegetation cover on the land is quite less. There are two main parts of the fort � Citadel and Summit. Just before the devastated entrance gate of the fort there are rock cut caves to the left. Some of them can be used for stay. To the right of the entrance one can see a sculpted tiger on a rock. Moving ahead from here we come across the fortification wall which is still intact and some bastions to the right after a short ascend. Moving back to the entrance gate, proceed on the path which is beneath the gate that leads to the fort summit. After 20-25 steps on the path towards left we come across some water tanks cut in rock. Although the water in it is potable but it stinks a bit. There are few more water tanks further on the same path and the summit/open area of the Citadel starts a few steps from here. The summit is well protected by fortified wall from all sides and some parts of the wall have carvings. The surface of the summit is elevated at one side where there are built in caves. After climbing this elevated surface one comes across the ammunition storage facility behind which there is a trench and couple of water tanks. There is an open space opposite the temple of Goddess Lalita mata here and behind the temple there are some rock cut caves. A path from here enters into a narrow tunnel like structure but actually is a secret doorway from where one can reach the summit. While descending from the secret doorway there is rock cut water tank on the way. Moving ahead on this path, the path turns to the right where there is a devastated temple of a Goddess. The path opposite to this temple leads us to the summit. Here there is a huge pond and a dome shaped structure below which there are two water tanks. Here too we can see parts of fortification wall. Keeping the pond to our right we have to ascend on the path which ends at the entrance gate. 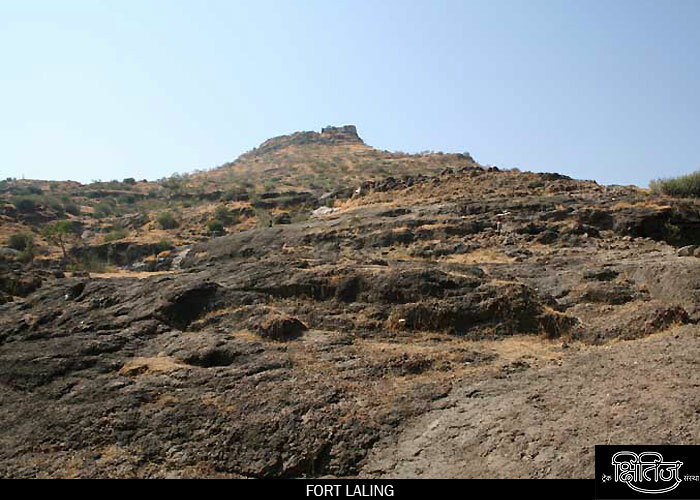 Laling fort is 8 kms from Dhule on the Dhule-Laling road. Mumbai-Agra highway runs parallel to the fort. Songir fort is adjacent to Laling. Regular buses from Dhule towards Malegaon can be taken to reach Laling which is also the name for its base village. The route to the fort starts from the water tank behind an old temple built in black rock dedicated to Lord Shiva. The path to the fort and Mumbai-Agra highway run parallel, so the ascend is easy to trace. One has to ascend by keeping the fort to our right and the path further reaches the devastated entrance gate by keeping the fort wall to our right. 1) The ammunition storage house can accommodate around 5 persons. 2) Caves near the entrance gate can accommodate around 10 persons but the cave is very unclean. Available in the water tanks near the entrance gate but the water stinks. 45 minutes from Laling village.